The kids at WebWalkers and Spiderlings last week picked out individual plants and pinpointed locations—the survey flags you can see in the parking lot meadows—to study the effects of the prescribed fire on the meadow and the unburned half of the field. Each week they will return to see the changes as the fields green up. It was also good just to get out to stretch our legs. The red maples are blooming, as are the male catkins on alder, and the quaking aspen is also started. Walking along the creek trail you can hear spring peepers in the cattail marsh on your right. Further down the trail you usually can hear wood frogs making their quacking call, but so far I haven't heard them yet this year. It has still been cold, though. Yesterday we also saw wood ducks repeatedly along the creek. Here are a couple photos from a while back; I just came across them and though they have little to do with current conditions at the preserve (we'll see what tomorrow's rain brings) I think they're interesting. 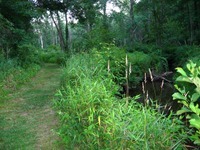 The first photo is from last summer showing a typical view of the creek trail looking south; the trail is on the left and French Creek on the right. 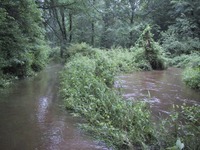 Below is the same view taken in June of 2003 after heavy rains. The water on the trail is not as deep as the creek, but looking at them they look the same! As far as the preserve right now we're dry but due some rain. The spring peepers are peeping; I also saw some killdeer here the other day. Buds are swelling and wildflowers will be here soon! Please join us for our annual spring cleanup/vine cutting day, Saturday, April 5 from 7:30 until 11 a.m. (You can join us at any time during the morning; we'll leave a map at the visitor center barn showing where we will be working.) We will be cutting vines in the hedgerows south of Harmonyville Road and near the State Game Lands. Bring gloves and pruners, loppers, or a hand saw. Today the Natural Lands Trust fire management team (that's Stewardship Staff wearing another hat) came together at Crow's Nest to conduct a prescribed burn of three meadows at Crow's Nest. Managing meadows with fire more closely replicates a natural process and keeps meadows open and encourages warm-season grasses and some wildflowers. So far we have seen milkweed, Indian grass, little bluestem, and other species thrive on occasional burning. Today we burned half of the meadow downhill from the Chief's Grove and parts of the meadow around the parking lot (both of these are plainly visible from Piersol Road). We also burned a small wildflower meadow back in the woods at the northern part of the preserve. If you come by Crow's Nest over the next few weeks you'll see how quickly these fields green up. I am still monitoring conservation easements, and am grateful for the landowners who are so generous to protect these beautiful lands. We try to complete monitoring easements each year in winter, which would be by... today. I have just two more so let's say I'll be finished in a couple more days. Last weekend Denise and I went camping in southern Delaware, at Trap Pond State Park. This is the most northern natural occurrence of bald cypress, Taxodium distichum, although it is hardy well into New York. (Botanists think that this is one of many species that was pushed south by glaciation and is still re-colonizing its northern territory—or would be if the habitat was still available.) Here Bailey is modeling next to the bald cypress "knees"—poorly understood structures that may give support to the tree in saturated soils. I was as excited to see this native plant growing in its natural habitat as I was when I first arrived at Crow's Nest years ago. I had seen cardinal flower, butterfly weed, and blazing star grown as ornamentals in gardens but was thrilled to see them growing here naturally. While it is important to cultivate communities of native plants in our yards it is also critical to save the places where they grow naturally. The weather Saturday was beastly, but we had a great time playing games and making crafts at the Crow's Nest Camp Reunion. It was fun to see parents and kids working and playing side by side. And then for just a few minutes the sun came out and it was very warm, so we ventured down to the creek. The kids in this photo are not wading in the creek—they're standing on the ground alongside the creek. The creek was roughly twice as wide as normal. I've heard a few tentative peeps of spring peepers so far, but no wood frogs quacking yet. It's been too cold here. I know only a few miles away the amphibian migration has been in full swing but here in this cold hollow we are a little behind the season. Due to the weather forecast, I am moving the Stone Walls Walk to Saturday, March 15 at 2 - 4 p.m. While it may not be raining today at the time of the walk, it will be slippery around the stone walls. We hope you can make the walk next week. We're wrapping up the winter sessions of WebWalkers & Spiderlings—snow and ice, mud and kids are a pretty good mix. The spring programs are only a few weeks away! The six-week sessions begin on March 27 and 28 and run through May 1 and 2. The theme is "Flowers and Fire" and you'll just have to attend to learn what this is all about. For more information please call us at 610-286-7955.